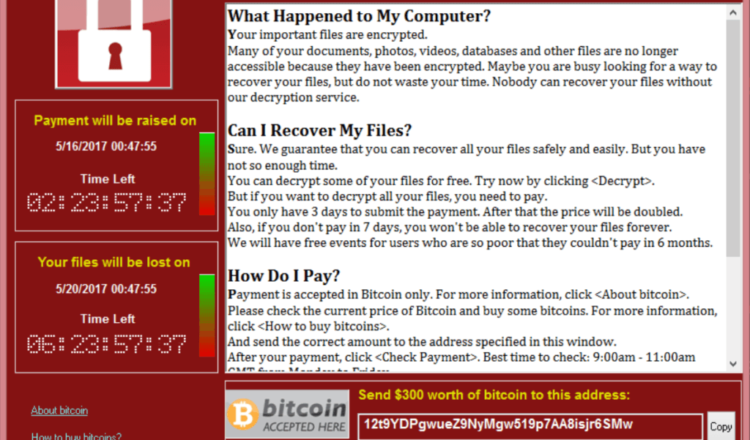 UPDATE: WannaCry Ransomware Attack up to 14.08007493 BTC on 92 payments as of 11:30am ET May 13. Balances more than doubled in 12 hours. Today’s widely reported WannaCry ransomware attack is extensive, growing and has already yielded ~USD$12k in profits according to a quick analysis of the BTC addresses involved. On May 12 the 3 bitcoin addresses known to be receiving extortion payments show receipt of 6.49372428 BTC in 39 separate transactions with ransom varying between .15 to .30 BTC each. None of the balances have been moved to new bitcoin addresses since receipt.